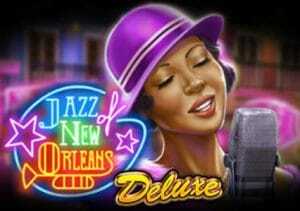 Play ’N Go is inviting players to a Louisiana music club in Jazz of New Orleans Deluxe. It’s a simple 5 reel, 5 payline video slot that comes with a bonus round where you can win up to 200 free spins with up to 5 extra wilds symbols. Spin the bonus wheel and you could end up with a progressive jackpot prize too. Tune up on your PC, tablet or mobile device from between 5p and £10 per spin. The action here takes place against a row of jazz clubs. On the reels you’ll see various signs, glasses of bourbon, a crab meal, trumpets, venues, sax players and a keyboard. The best of the standard symbols is the female singer who will get you 20 times your bet if you land 5 on the same payline. The best payer overall is the moon which is the scatter. Land 3, 4 or 5 of these anywhere on the same spin and you’ll pocket a payout worth 5, 25 or 75 times your total bet. Helping your chances of creating a winning combination is the neon-style Jazz of New Orleans logo. This pays 10, 20 or 40 times your bet if you land 3, 4 or 5 in combination as well as replacing all other symbols rather than the scatter. Unusually, it’s the wild rather than the scatter that triggers the bonus round. Land 3 or more wilds and you’ll activate the Free Spin Bonus feature. Before the round begins, you’ll be offered the pick of 5 different jazz clubs. Choose 1to reveal how many free spins you’ve been awarded. This can be anything up to 25. You’ll then be shown a selection of musical instruments. Pick again. This decides how many extra wilds will be in play for the duration of the round. You could end up with 5 extra wilds if luck is with you. You can re-trigger more free spins here, up to a maximum of 200. Jazz of New Orleans also offers the chance to land a progressive jackpot prize. The round is triggered by landing 3, 4 or 5 of the golden ring on the same spin. Depending on the number of golden ring symbols from the triggering spin, you’ll spin the bronze, silver or gold jackpot wheels. Even if you start with the bronze wheel, you can work your way up to the gold where the potentially massive Dream Chance Jackpot can be won. There’s nothing especially wild about this virtual night out. The visuals are decent enough but don’t have any kind of wow factor. Likewise, the soundtrack which we found slightly underwhelming. The gameplay here is pretty vanilla too, especially in the base game. Things can pick up in the bonus round if you manage to combine a good haul of free games with multiple extra wilds. It might be a little too middle of the road for some tastes but Jazz of New Orleans Deluxe is a solid if rather unspectacular performer. Play ‘N Go offers you much better video slots with music-inspired Banana Rock and Wild West-themed Gunslinger: Reloaded worth trying.